Please note the office will be closed from Friday the 05th April and will re-open on Monday the 15th April 2019. You may have seen David Ainsley on TV talking about having recently seen a boat apparently scallop dredging in the Marine Protected area around the Garvellachs. Many ScotSAC divers will be familiar with this area and be aware of the recovery the seabed has undergone over the years when the area has been protected from scallop dredging. Following a meeting in Oban which included many interested parties such as scallop divers, sports divers , creel fishers and Coastal Community groups a statement has been prepared and sent to Rosanna Cunningham and Fergus Ewing and other appropriate politicians. There are existing laws to protect these areas and they are not being enforced. David believes there have been nearly 100 reports of suspected illegal dredging in MPAs between August 2015 and May 2018, but there have been very few prosecutions and only very small fines. Marine Scotland seem to be very reluctant to pursue these illegal activities. ScotSAC has added it’s support to the statement but if anyone wants to lobby MSPs individually please feel free. The last sentence was inserted at the last minute by the concerted efforts of the UK Recreational diving community, who have also prepared the attached Risk Assessment, which will mean that for the majority of ScotSAC members the current 2.5 year cycle will remain provided the good practice noted in the Risk Assessment is followed. Members should be aware that these regulations will require cylinders to be tested annually unless compliance with best practice outlined in the risk assessment can be demonstrated. 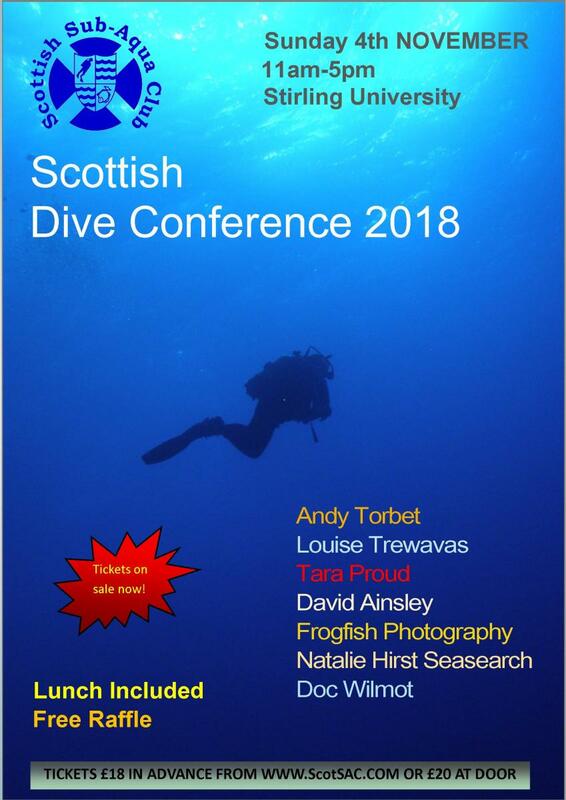 The 2018 Scottish Dive Conference will be held on 4th November at Stirling University from 11am until 5pm. Tickets are £20 on the day but can be purchased from our website at a reduced cost of £18. Concessions are available for students and members who have volunteered to help out on the day. The next O2 Heart start course will be held on Sunday the 11th November 2018. If you would like to attend the course please contact hq@scotsac.com for further details.